The US Food and Drug Administration (FDA) today approved a new nonsurgical weapon in the fight against obesity — a pair of connected saline-filled balloons that are temporarily implanted in the stomach to trigger a feeling of fullness and jump-start weight loss. The device, called the ReShape Dual Balloon (ReShape Medical), is inserted endoscopically through the mouth and then filled with saline solution. The outpatient procedure takes less than 30 minutes while the patient is mildly sedated. 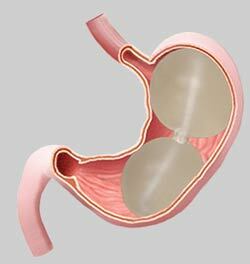 The FDA said that the satiety-inducing ReShape Dual Balloon does not alter the stomach's natural anatomy. The intragastric device, which should be removed after 6 months, is meant to accompany a medically supervised diet and exercise program. It is indicated specifically for obese adults with a body mass index of 30 to 40 kg/m2 with one or more obesity-related conditions such as diabetes who have failed to lose weight through diet and exercise alone. "For those with obesity, significant weight loss and maintenance of that weight loss often requires a combination of solutions including efforts to improve diet and exercise habits," said William Maisel, MD, MPH, acting director of the Office of Device Evaluation at the FDA's Center for Devices and Radiological Health, in a news release. "This new balloon device provides doctors and patients with a new non-surgical option that can be quickly implanted, is non-permanent, and can be easily removed."